The Rustler 31 has an excellent reputation as a capable seaworthy yacht. This lovely boat has had two owners from new changing hands in 2012. They have reluctantly placed her on the market due to health reasons. This yacht is a second-generation Rustler 31, the mast and its supporting bulkhead are further aft than in the 1960's version giving a larger foresail and smaller main. This also enables the construction of a self-contained heads compartment. The first owners launched her in 1983 and prior to this they applied three coats of two pot epoxy to the hull below the waterline as a preventative measure against Osmosis. Since then she spends 5-6 months ashore each year. This yacht was fitted out with excellent quality fittings throughout by the first owners and the current owners have also spared no expense. For example, all winches are Lewmar self-tailing, the sails are Owen mainsail 2018, head sail 2014, the spars are Kemp, and this is now clearly demonstrated by the condition of the boat today. If you are considering a go anywhere safe and seaworthy cruiser this one should be on your shortlist. 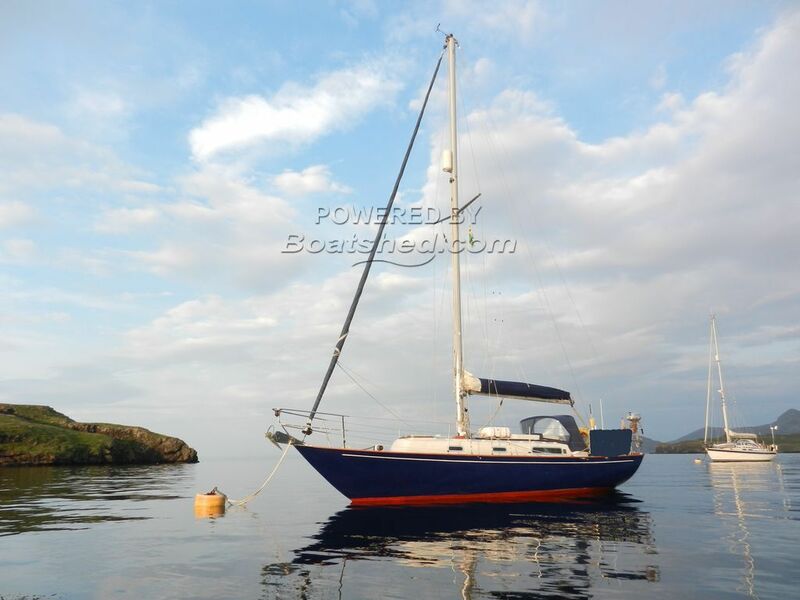 This Rustler 31 has been personally photographed and viewed by Ian Sawkins of Boatshed Scotland. Click here for contact details.